Having grown up in the western part of Singapore all my life, I’ve seen how much this side of Singapore has blossomed in these past 5-10 years. And if I’ll need to choose my favourite place in the west side that I really enjoy spending my time, it’ll definitely have to be Jurong East! As the western region of Singapore gains prominence and momentum with redevelopment and growth, big retail businesses have also made their entrances. Now, westsiders have plenty of makan and shopping options accessible to them, right in the heart of Jurong East! 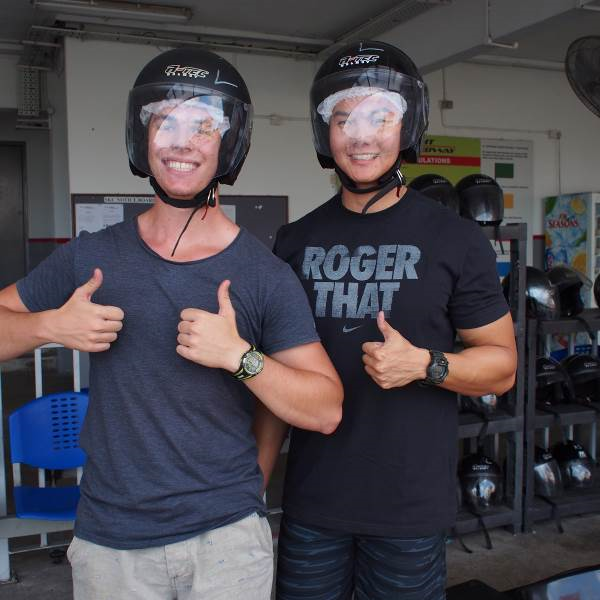 When I was told to play host to a tourist visiting Singapore for the very first time and the criteria is to plan a ½ day activity in the west, I found it to be a piece of cake! Planning a ½ day activity for an Aussie bloke is really interesting. 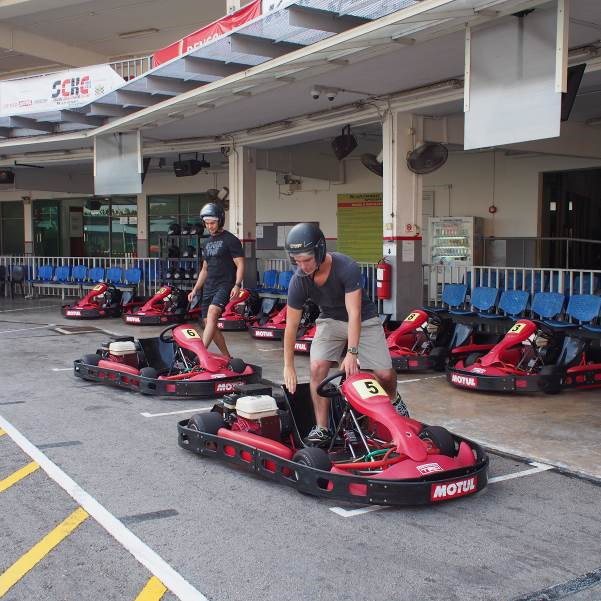 There are quite a number of exciting activities that I can choose from but I eventually chose an activity with some adrenaline pumping action: GO-KARTING! We arrived at Kartright Speedway for some Go-Karting action and Riley was quite excited. He told me he had only tried it once back in Australia and the experience was terrible. I confidently told him that what he was about to experience was going to be totally different. 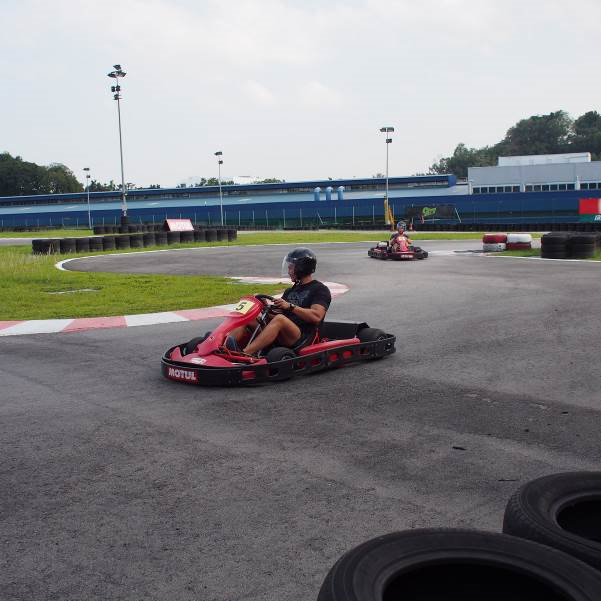 Similarly, I have had my fair share of below average Go Karting experience in Malaysia, Thailand & Indonesia. Call us Singaporeans pampered, but we like a nice clean environment and most importantly, a safe experience. I was really impressed when I saw Bridgestone tyres & Toyota Engine being used. I always thought that the engines were DIY!! After going through a quick safety brief by the manager in charge, we were all ready to RACE! 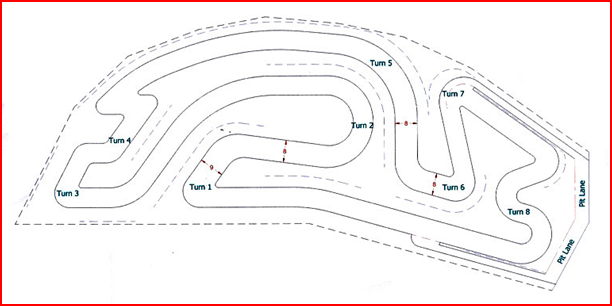 One really interesting feature that Kartright Speedway offers is that if you have a driver’s license, you’re entitled to drive at 50km/h. Non drivers will only be able to travel at 30km/h. That’s a really good rule to implement to ensure the safety of all track users. Before we started, a side bet was made. The winner will choose the cuisine for dinner. 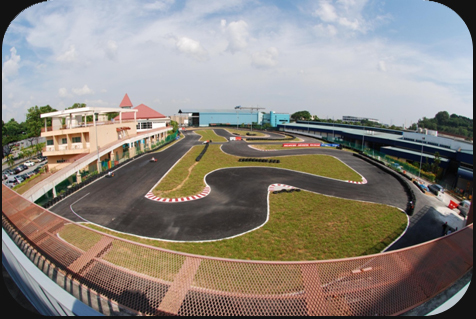 Enough of talking, 15 Laps Race..let’s start..
With a total of 8 different types of bends to overcome in each lap, I was determined to push the Go Kart to its absolute limit! 15laps later, I beat Riley by a spilt of a second. It was a really exciting race and we didn’t want to leave. I decided to bring him to Westgate for dinner as I personally love the food choices it offers. What I really love about Westgate is that it has an open air courtyard with restaurants and cafes to relax in. But regardless of where you are at, the environment is still very nice and cooling. As Riley is someone who enjoys being outdoors, I decided to have a semi Al Fresco dinner at Brotzeit. 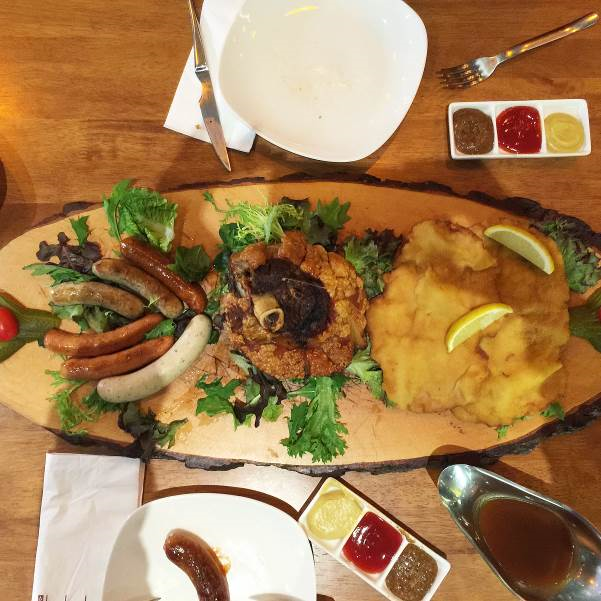 This popular German restaurant is recognised for its great meat & beer selection. 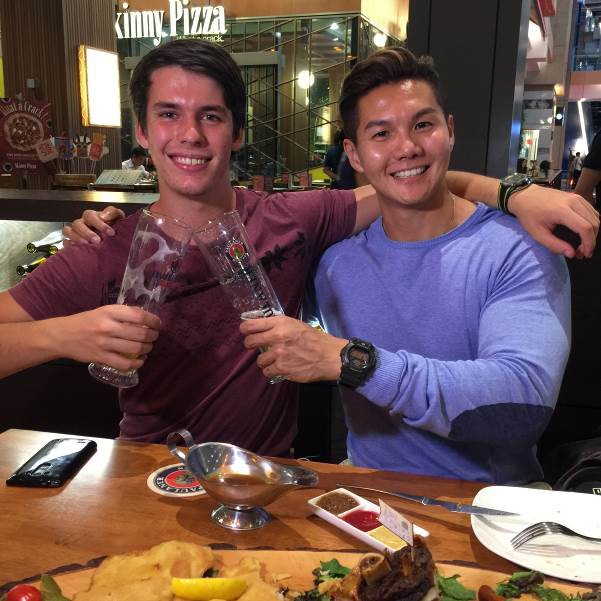 As Brotzeit is currently only found in Perth, Riley has yet to try it. I’m really glad that popular restaurants that were previously only found in town have expanded to the west. And when 2 famished guys get to order anything they want, this is what you get…. As the evening came to an end, I asked Riley how he felt about his experience in the western part of Singapore. He instantly replied with 2 words, SIMPLY AMAZING! He was really impressed with how clean Singapore is and the amount of fun that he was able to experience out of the central area of Singapore. 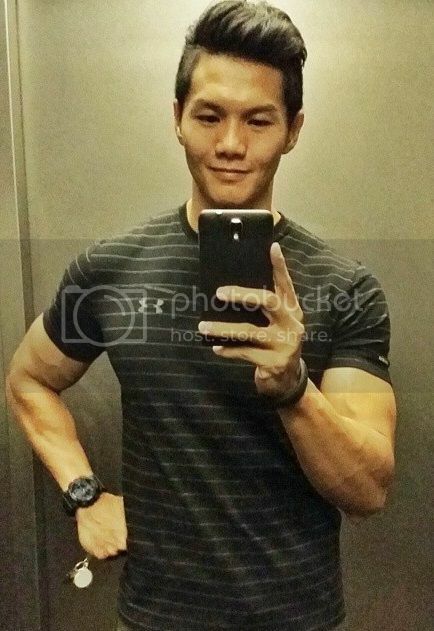 He is also really amazed to see distinct differences in the malls situated in Jurong East. Westgate is filled with great food and big retail stores; IMM being the largest outlet mall & JCube being the entertainment and lifestyle hub of the west. I was also really glad to be able to host Riley, a first time tourist in Singapore and I also got to rediscover the beautiful western part of Singapore. Cheers to a new friendship & a jolly good time! To find out more about the west, make sure to click here!